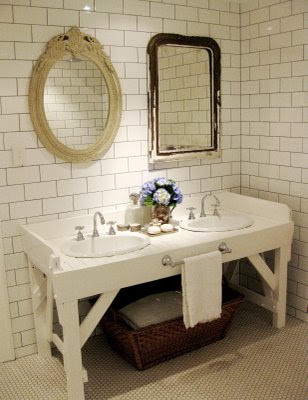 I love these blogger bathrooms. Although I have gone for something more modern, I love the traditional metro tiles and penny rounds look. Refurbished bathroom belonging to Anna, from Absolutely Beautiful Things. Upstairs bathroom of Anna (another one) of Door Sixteen. I love the wallpaper, which is Bindweed, from Ferm Living. 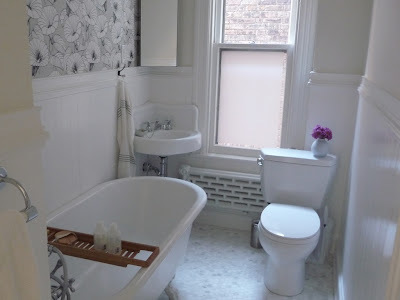 The pictures below are of my recently refurbished bathroom. It is difficult to get a photograph of the whole room, as it is pretty small, but it is quite a triumph I think - it was a disaster before. I knocked down a cupboard to give the bathroom a little extra space - less than a metre, but it's made all the difference. and wall hung everything; towel rail, sink and toilet. The tiles are the same on the walls and floor, and I used a dark grey grout on the floor, and ivory grout on the walls. This tip was given to me by my friend Charlotte, and it has turned out to be a brilliant idea. I have underfloor heating, and this is my favourite room in the flat. I'm just waiting for the perfect mirror and I will be finished. Oh wow love these - the first image really catches my eye! Love bathroom #2! Fabulous job on your own bathroom! Your bathroom looks fantastic - I love the simplicity and uncluttered style you have chosen and the clever use of space, xv. I love that two completely different looking mirrors are placed side by side, it instantly makes it interesting.